Watching birds is an educational and engaging hobby, which can offer the unique blend of tranquility and excitement that you won’t find anywhere. Almost everyone likes sounds of cute birds in the early morning, who doesn’t? Though it is nice, it would not happen every day. You can apply a trick to experience all these wonderful moments every day at your home. 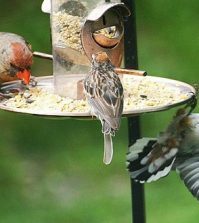 You can build bird feeder by using few homemade bird feeder ideas and enjoy these moments every day. You can make this on your own. Make two holes on each sides of bottle, which are ¼ of the way up from the bottom of the bottle. Put a stick through those holes in order to make perches. Bottle holes should be larger than the stick size, so that the bird can get food. Fill the bottle with bird seeds and hang it in your lawn. If you have old floppy disk, you can use them as funky bird feeder. 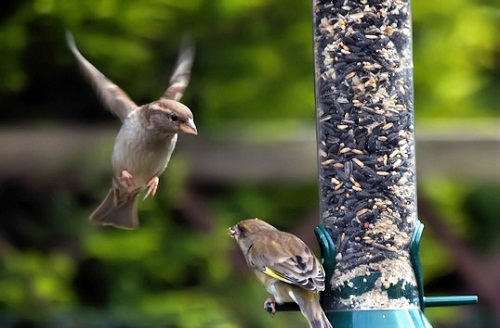 By taping bottom edges of 3 floppy disks together you can make wonderful homemade bird feeder. See Instructables.com to know how to make it. Take an ice cream cone and cover it with peanut butter and spread different bird seeds all over it. Hang it with a thread from the tree in upside down direction. These are easy for kids to make. Get pine cones and cover those with peanut butter and then roll those cones in bird seeds. Hang over this to trees in your backyard. Place the Christmas tree in your back yard in the end of holiday season, hang it with pine code feeders, cranberries, spread peanut butter over branches, because in winter season birds need fat especially.